Move over mancaves — she sheds are the new big thing in personal home getaways. Just like Glick Woodworks has been your resource for all things storage, we’re your go-to for fresh she shed ideas — and the high-quality sheds to make it happen. Learn how to build your own she shed — and check out ALL of our she shed ideas! One of the reasons that she sheds are so popular is that they allow you to express your personality in a big way. While in many cases, mancaves provide that same personal touch, she sheds are unique because they’re a totally separate building — your own, truly-private getaway. Here are some of the coolest she shed ideas we’ve seen. What it’s all about: For all the bookworms out there, meet the she shed of your dreams. This she shed idea is all about building a perfect place to read and to store your beloved personal library. What you need: A few bookshelves to keep your books and a comfy chair or two where you can read for hours. What shed you need: Any high-quality, watertight shed can do the trick. Since you’re housing your library, elite waterproofing is a must — fortunately, all Glick Sheds are 100% waterproof. For maximum natural reading light, you might want to include an extra window or two. Check out our shed options to see all of your window choices. What it’s all about: Whether you’re an aspiring yogi or want to tone up in your backyard, you can outfit your shed for some light exercise. What you need: For this creative shed idea, you’ll want to pack it full of the workout gear you like best — a treadmill, stationary bike elliptical, free-weights or some yoga mats. What shed you need: You’ll want a shed or barn with extra-high ceilings to make sure you have ample room to stretch and move. Plus, you’ll want to customize your shed with an extra door to create a cross-breeze to cool you off while you break a sweat. What it’s all about: If you’re tired of doing your crafts at the kitchen table and it’s time for an upgrade, this is the creative shed for creative types. What you need: What you need for this shed depends on the craft you’re passionate about. Generally, you’ll want a sturdy flat surface and comfortable seating, so you can easily spend hours in your backyard she shed workshop. 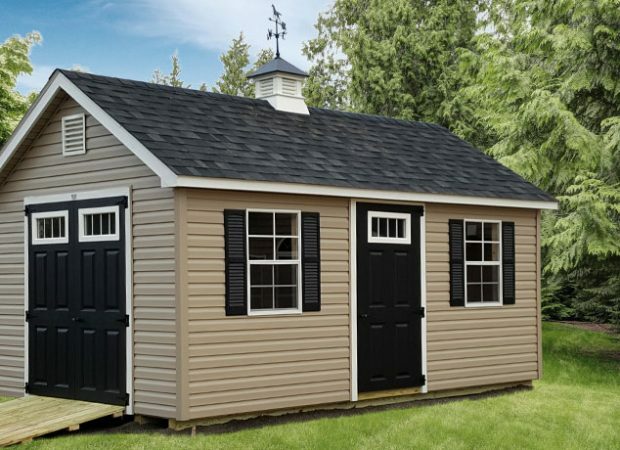 What shed you need: Almost any of our sheds can do the trick, but if ventilation is important to your craft, you’ll want to consider adding an extra door or window to build a cross breeze — as well as a ridge vent. Another great feature would be proper craft cubbies and built-in storage to organize your crafting tools and materials. What it’s all about: This concept shed is all about building the home office that makes you enjoy working from home. 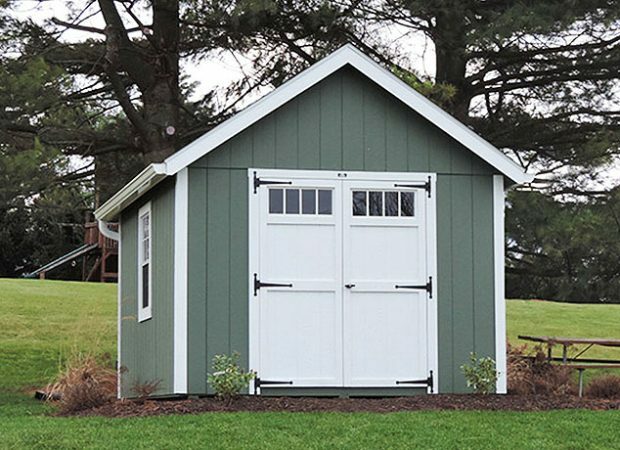 For many digital professionals, a shed is the perfect size to handle all of their business needs. What you need: a desk, chair, electricity, internet access and, of course, motivational posters to hang up. What shed you need: All of our sheds can be equipped with electricity, and that’s the number one thing you need. If you plan on working in the shed year-round, you’ll want to consider some extra insulation too. Learn more about installing an office or living space in a garage. What it’s all about: Equal parts pretty hideaway and pampering place, your backyard spa is the place you’ll unwind after a long and hectic day. Whether you want to soak your feet, paint your nails, or get a full massage, you can have the perfect backyard space for it. What you need: Depends on how you like to be pampered, but a mirror, some ambient lights, and some privacy curtains are a great place to start. If you’re really looking to invest in your shed, consider a full-massage table or an ultra-relaxing massage chair. What shed you need: Unlike some other she shed ideas that require natural light, a spa might do better with less. That way you enjoy dim, ambient lighting, and you’ll feel like you have ample privacy. What it’s all about: This she shed idea is perfect for putting your green thumb on display. Turn your shed into your private arboretum AND have a great place to entertain guests. What you need: Shelves and tables to display your greenery, some gardening supplies, and a few comfortable places to sit when your friends come to visit. What shed you need: A shed with windows, windows, and some more windows. Lots of windows means natural light helps your plants grow. Plus, all of those windows will allow people to admire your work from the inside or outside. What it’s all about: Going out for a fancy meal…in your own backyard. Whether you prepare the meal and lattes on your own, or you just bring home your takeout to the she shed, you’ll have a great time. You and your friends’ favorite entertainment destination might be right out back. What you need: Table for two, tablecloth, cute chairs, a panini maker, French press or deluxe coffee maker, and a mini-fridge. What shed you need: What’s a hip restaurant without some curb appeal? More than anything you’ll want your café she shed to look gorgeous, inside and out. Learn more about matching your shed style to your house. The real draw of the she shed movement is building a space that encapsulates your personality in the shell of a seemingly ordinary garden shed. While there are great she sheds for all tastes and personalities, the one thing that all great examples have in common is a great shed at the core. 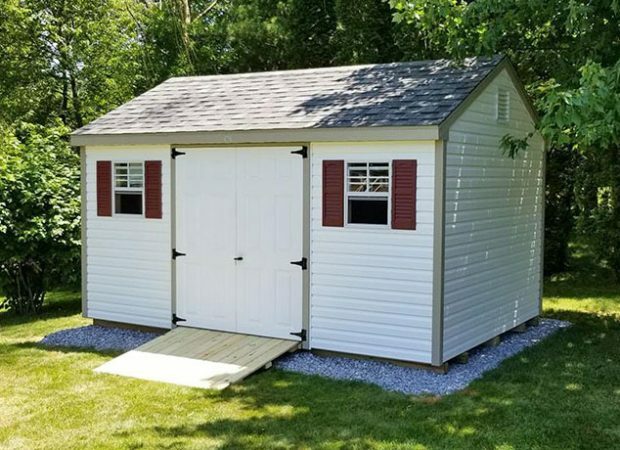 Glick Woodworks sheds are such a base for the she shed of your dreams because they are 100% waterproof, can be outfitted with electricity, and can be customized to meet your needs. All while boasting a gorgeous and rustic look! If you’re ready to bring your she shed ideas to life, we’re the perfect team to provide the perfect shed. Contact us to discover ALL of your options and to get your shed quotes! Contact Us to Bring Your She Shed Ideas to Life! "Glick Woodworks came highly recommended from others and I am very happy we purchased our shed from Glick’s. We had an extremely good experience from placing the order to delivery!"